As Earth Day approaches, Capital Region researchers are doing their part to honor and advance the purpose of the annual event through innovation. 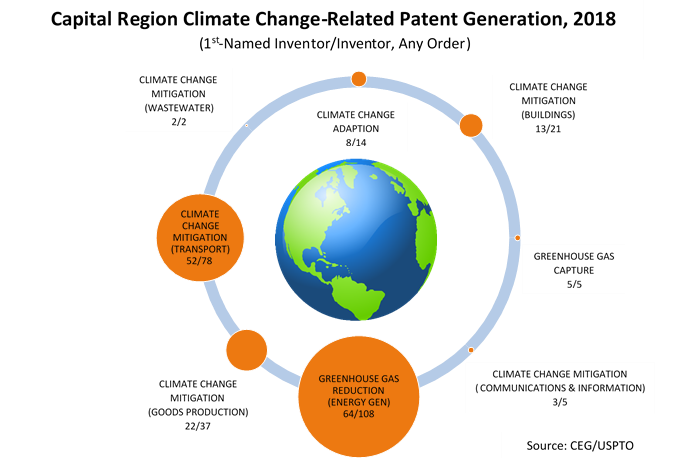 In fact, in 2018, inventors in the eight-county Capital Region were listed on more than 200 patents for technologies or applications for mitigation or adaption against climate change, according to a Center for Economic Growth review of patents listed in U.S Patent and Trademark Office’s Patent Full-Text and Image Database. In 2018, local investors were listed on 238 patents in the Cooperative Patent Classification (CPC) Y02 classification, which primarily covers technologies or applications for mitigation or adaption against climate change. Of those patents, 147 had a local inventor listed first, typically an indication of their lead role in the innovation. Three-fourth (177) of the regional climate change-related patents for energy generation, transmission and distribution technologies that will reduce greenhouse emissions. These include wind, steam and gas turbines and photovoltaics, with General Electric, through GE Global Research in Niskayuna, being assigned the lion’s share of patents in this class. Another major class was transportation-related climate change mitigation technologies (78). 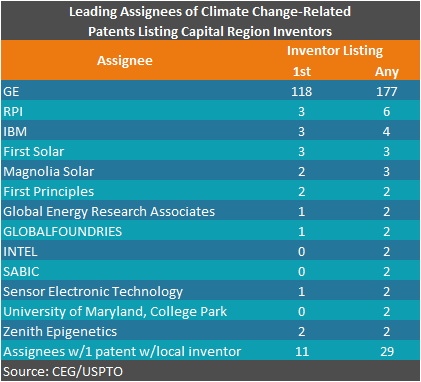 In all, local inventors worked on climate change related patents that were assigned to 42 firms. In some cases the local researchers were employed by these firms but in others they collaborated with the assignee’s researchers.